Added Bizarre Fruit from StrangerVille GP. Added support for the new laptop computers from StrangerVille GP. Fixed a Pie Menu issue to show up in Skill Restriction Version. 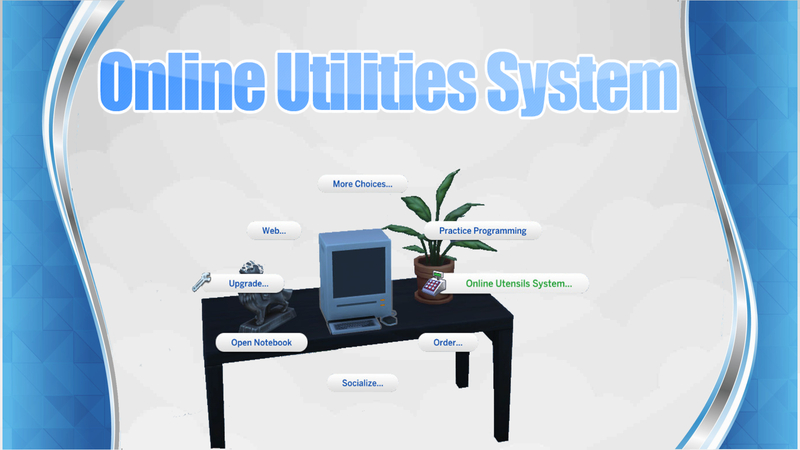 Fixed the mod title to "Online Utilities System", it is more appropriate. Sorry for that mistake. 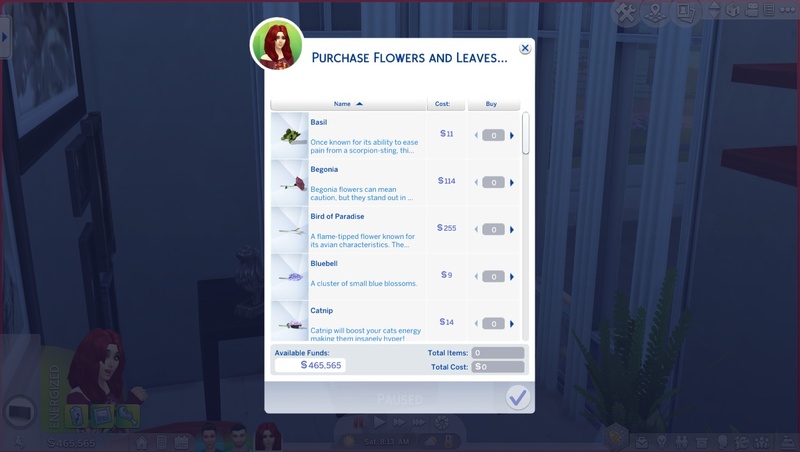 This mod lets you buy specific flowers (no random seed packets) and insects to avoid to enter into build mode. 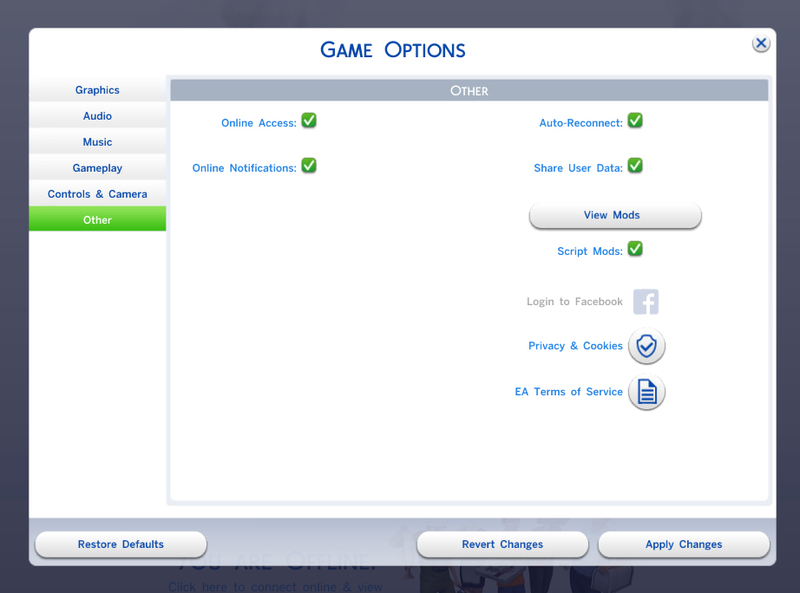 It was made for a quiclkly access without cheats and it is under PC menus. It is very well known that you can have anything with debug cheat, but this will let you have it in a handy way. Now you will have a new pie menu via PC called "Online Utilities System". 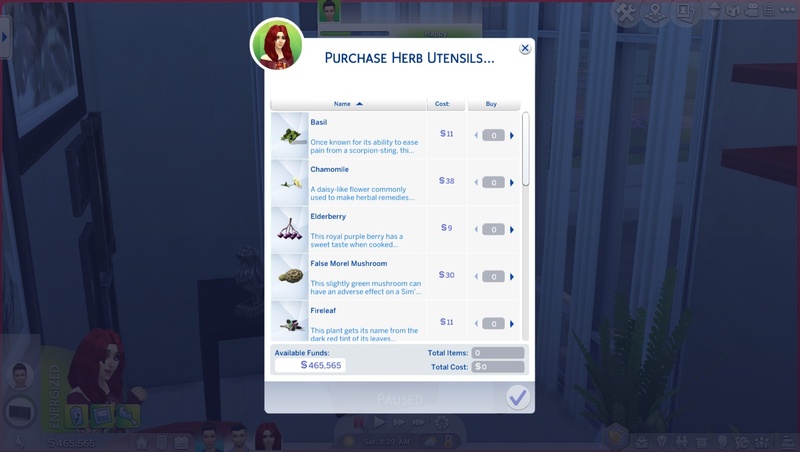 These are the general items you can purchase, depending on which version of the mod you have. Read below for more info about the versions to know which items will have. Purchase Flowers and Leaves Blue Bells, Chrysanthemum, Daisy, Snapdragon, Holly, Lily, Rose, Tulip, Wolfsbane, Begonias, Christmas Rose, Crocus, Dahlia, Snowdrop, Bird of Paradise, Death Flower, Orchid, Fang Flower, Spinach, Sage, Parsley, Basil, Catnip Madnip, Catnip Napnip, Catnip Normal, Catnip Nuzzlenip. Purchase Fruits and Vegetables Carrots, Lemons, Apples, Grapes, Onions, Pears, Green Beans, Cowplant Berries, Dragon Fruits, Pomegranates, Growfruit, Green Peas, Strawberries, Plantains, Mushrooms, Bell Peppers, Blackberries, Cherries, Tomatoes, Trash Fruits, Bonsai Buds, Black Beans, Avocados, Potatoes, UFO, Glow Orb, Quill Fruit, Plasma Fruit, Garlic, Sixam Mosquito Trap, The 7 Emotion Berries, Forbidden Fruit, Money Fruit, Bizarre Fruit. Purchase Magic Beans Angry Magic Bean, Playful Magic Bean, Sad Magic Bean, Uncomfortable Magic Bean, Flirty Magic Bean, Confident Magic Bean. Purchase Herb Utilities Chamomile, Toxic Chamomile, Fireleaf, Poison Fireleaf, Elderberry, Noxious Elderberry, Huckleberry, Muckleberry, Morel Mushroom, False Morel Mushroom, Sage, Parsley, Basil, Tomatoes, Strawberry. Purchase Insects Termite, Dragonfly, Bee, Stink Bug, Fire Ant, Rainbow Firefly, Firefly, Locust, Walking Stick, Will-o-the-Wisp, Dust Spirit, Blue Morpho Butterfly, Jezebel Butterfly, Katydid, Ladybug, Luna Moth, Mosquito, Jewel Beetle, Mantis, Monarch Butterfly, Dragon Dragonfly. Online Utilities System: you can have access to Online Utilities System when you have the required skills listed below. 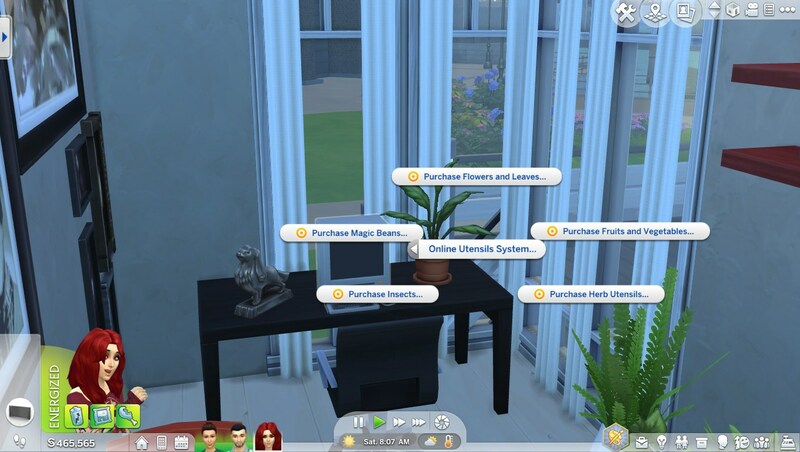 You need to have Gardening Skill level 10 to unlock: Purchase Flowers and Leaves, Purchase Fruits and Vegetables, Purchase Magic Beans and Purchase Herb Utilities. You need to have Flower Arranging Skill level 10 to unlock: Purchase Flowers and Leaves. You need to have Herbalism Skill level 10 to unlock: Purchase Insects and Purchase Herb Utilities. This will be very handy to have utilities for this skill. This version under the Purchase Fruits and Vegetables will not have only two items (Forbidden Fruit and Money Fruit). And under Purchase Insects category will only have the insects that are required to use Herbalism Skill (Termite, Dragonfly, Bee, Stink Bug, Fire Ant, Rainbow Firefly, Firefly, Locust, Walking Stick, Will-o-the-Wisp). Online Utilities System (No Skill Restriction): This will not require any skill, so you will have the new pie menu just only by clicking on the PC with no restrictions. This version under the Purchase Fruits and Vegetables category will have two new items (Forbidden Fruit and Money Fruit). Plus, under Purchase Insects category will have the rest of the insects too (Dust Spirit, Blue Morpho Butterfly, Jezebel Butterfly, Katydid, Ladybug, Luna Moth, Mosquito, Jewel Beetle, Mantis, Monarch Butterfly, Dragon Dragonfly). It was made this way to not have it so easily or for only having it in a free way, depending on your choosing. Thanks to dannywangjo for Chinese Translation. Thanks to BestSomeone for Portuguese Translation. Thanks to Maïa Game for French Translation. There isn't any, this is not an override mod.